The mission of JROTC is to motivate young people to be better citizens. At Manual Arts emphasis is placed on building character, promoting good citizenship, and developing leadership skills among the youth. JROTC cadets participate in many extracurricular activities which provide service and support to the school and community. They perform in military drill competitions, and carry the National Colors in parades. In recent years they have experienced annual encampments at Camp San Luis Obispo, a National Guard installation. 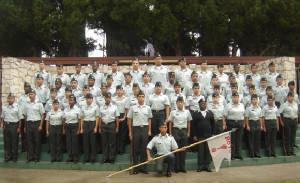 The JROTC Program was established in LAUSD on March 1, 1919. Units were originally established at Franklin, Gardena, Hollywood, Jefferson, Lincoln, Los Angeles, Manual Arts, and Polytechnic High Schools. "A cadet does not lie, cheat, steal, nor tolerate those who do"